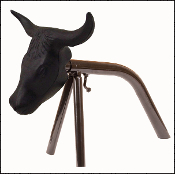 Combo includes the Large tripod steel roping head stand(31"x22") and a 24" Corriente Steer head! You also have the option to add a 30' ranch rope to save even more! Includes all hardware and also includes rods to use the head with a bale of hay instead of the stand if needed.